What Is a Pit Bull Shar-Pei Mix Called? What do you get when you cross a pit bull and a Shar-Pei? The adorable combo is referred to as a sharpull terrier. With any canine cross, the offspring look like a combination of the two breeds, although some puppies will resemble one parent considerably more than the other. Both of these powerful, muscular breeds are approximately the same height and weight at maturity, and both have short coats. However, one of the Shar-Pei's most notable attributes is wrinkly skin, so the sharpull terrier could appear more wrinkled than the pit bull but not as wrinkled as the Shar-Pei. One caveat: You can never tell what you're going to get when mixing two breeds. A canine cross with a Shar-Pei may or may not include wrinkles. So cute! A little sharpbull terrier puppy. Your sharpull terrier will probably end up a similar height and weight to its Shar-Pei and pit bull parents, since both are approximately the same size. At maturity, the Shar-Pei stands between 18 to 20 inches tall at the shoulders, weighing between 45 to 60 pounds, according to the American Kennel Club standard. Males are larger than females. The breed standard for the American pit bull, recognized by the United Kennel Club but not the AKC, specifies that adult male dogs should stand between 18 to 21 inches tall, and females 17 to 20 inches tall. Males weigh between 35 and 60 pounds, with females weighing between 30 and 50 pounds. While the AKC (American Kennel Club) has some pretty strict coat standards for both Shar-Peis and pit bulls, a sharpull may end up with a coat that is more one than the other, or a little bit of both. The Shar-Pei breed standard calls "the extremely harsh coat" one of the dog's distinguishing features. Any sort of softness or waviness is unacceptable. The pit bull's coat is short, smooth and somewhat stiff. In the Shar-Pei, only solid colors are permitted, while the pit bull standard allows any color or pattern with the exception of albino or merle. The latter refers to a genetic color pattern somewhat like dapples, with darker shades of the same hue on a lighter background. Sharpull terriers come from strong stock. The pit bull originally was bred as a fighting dog. Unfortunately, illegal dogfighting with these canines still goes on. The Shar-Pei was bred to fight as well as herd and hunt in his native China. That means a cross of the two breeds could be aggressive to dogs and other animals. Since both breeds are strong animals, a sharpull terrier needs an owner experienced with dominant dogs. Neither breed is especially good with kids, so a sharpull may not make a great choice for a family dog. While the pit bull can be quite affectionate towards his people, the Shar-Pei tends toward independence and stubbornness, and is more of a one-person pet. That being said, a sharpull may take after her pit bull roots. Both parent dogs are prone to some health issues, and knowing what they are can help you catch or even prevent issues in your sharpull. 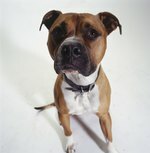 Pit bulls are relatively healthy dogs, although they are prone to hip and eye issues, as well as a genetic condition called cerebellar degeneration. This can lead to balance and walking issues. Shar-Peis have a lot of health issues. You might want to find a vet specializing in the breed. A hereditary condition known as Shar-Pei fever causes regular temperature spikes, swollen hocks and possibly vomiting and diarrhea. The wrinkly skin collects bacteria causing infections, so regular wrinkle cleaning is necessary. Eye problems also plague the breed, as do allergies, slipped kneecaps, elbow and hip dysplasia and hypothyroidism.